DEVELOPING A NEWSLETTER IS A SIMPLE, SMART, AND COST EFFECTIVE WAY TO KEEP IN TOUCH WITH YOUR CUSTOMERS. 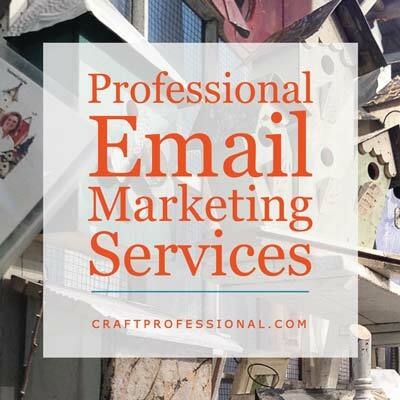 THIS SERIES ON EMAIL MARKETING WILL SHOW YOU HOW TO SET UP AND GROW YOUR OWN E-NEWSLETTER. Before we jump into the email marketing basics series, I'd like to arm you with some definitions of jargon you'll find in email marketing circles. These terms will come up throughout this series, and you'll see them if you research email marketing on other sites. If you ever forget what a term means and need clarification, jump back to this page for the definition. Communicating with a group of people who have expressed interest in hearing from you via email. People choose to subscribe to your newsletter, and you provide information relevant to your business and your subscribers' interests. The percentage of subscribers who open your newsletter. Don't expect everyone to open your emails. Depending on the industry, standard open rates range from about 20% to 30%. That doesn't necessarily mean only 20% to 30% of people are reading your emails because the technology used to measure open rate isn't perfect. This statistic doesn't necessarily capture everyone who opens your newsletter. In spite of imperfections, open rate is a useful statistic to track. By watching how your open rate changes from one mail-out to the next, you can see what headlines resonated with your audience, and experiment with mail-out times and dates to see what is most effective for your audience by tracking your open rate. A double opt in email system requires subscribers to confirm that they want to receive your email twice. First, they submit their email via an online newsletter sign up form. Then, the email marketing software you use automatically sends an email to the address they provided. The new subscriber must click on a link in that email to confirm they wanted emails sent to that address. If they ignore the email, they won't be signed up for the newsletter. A double opt in system protects people from being signed up to mailing lists they didn't want to sign up for. It protects you from accidentally sending emails to someone who didn't want them. It helps to ensure you have a list of people who truly want to receive your emails, and it helps to reduce the potential for spam complaints against your newsletter. Unsubscribing is when someone who was once an email subscriber chooses to stop receiving your newsletter. No matter how fabulous your newsletter is, people will unsubscribe. Getting a few unsubscribes after each mail-out is not a negative. As your newsletter list grows, it can become more expensive to manage, so if someone is no longer interested in reading your messages, it's much better if they unsubscribe, versus continuing to receive emails they never open. Your unsubscribe rate is the number of people who unsubscribe each time you send out a newsletter. A few unsubscribes are to be expected. It's helpful to watch how your unsubscribe rate changes when you make changes to your newsletter. If you make a substantial change to the structure, or content, or delivery time, watch your unsubscribe rate. If it is much higher than usual, you'll know you did something that some subscribers didn't love. This statistic measures the number of emails that actually end up in subscribers' inboxes. Your newsletter's click through rate is the percentage of people who clicked one of the links in your email. If you're sending out newsletters to encourage people to visit your blog or your online shop, your CTR will tell you how well you're meeting that goal. Strictly speaking, spam is marketing email sent to people who did not choose to receive email from that sender. From the perspective of an email marketer, it's important to be aware that subscribers can mark a newsletter as spam for all kinds of reasons, even if they did initially choose to receive your newsletter. For example, if emails are sent too frequently, or they don't recognize your newsletter as something they signed up for, they may mark it as spam. A small number of spam reports are acceptable, but if your newsletter gets marked as spam by too many subscribers, it may suffer. Autoresponders allow you to pre-write a series of several emails, and subscribers receive them in order no matter when they signed up. They can be fantastic time savers. Without an autoresponder, you write newsletters on your regular schedule, and new subscribers jump in and get whichever email is next to be published. With an autoresponder series, if someone signed up this week, they would receive email number one, and then they'd continue, over a defined time period, to receive the series of emails you prepared. If someone else signed up two months later, they would also start with the first email and eventually get all of the emails over time. Autoresponders aren't right for every business, but they can add a huge degree of efficiency to your newsletter, and they can take subscribers through a logical sequence of information. Subscriber segmenting allows you to divide your mailing list by certain characteristics. For example, you could select out the people who didn't open your email and resend it to them with a new subject line. 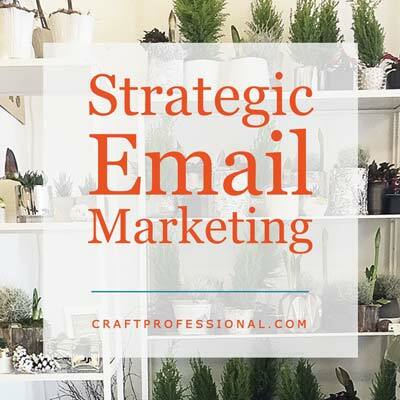 This practice is getting a little beyond email marketing basics and entering into the realm of more advanced email strategies. Your most wanted response is the thing you most want your newsletter subscribers (or website visitors) to do. If you want subscribers to click on a link to your Etsy shop, that's your MWR. 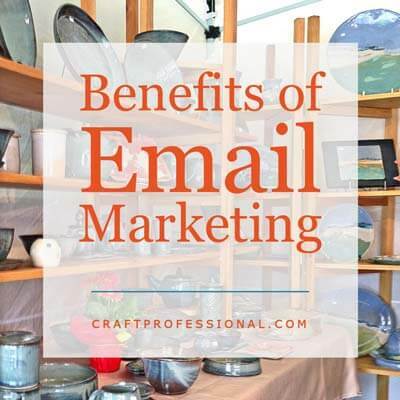 If you want subscribers to visit you at a craft show and use a coupon you included in a mail-out, that is your MWR. Your most wanted response can vary from one mail-out to the next. Knowing what you most want readers to do can help you design your newsletter more effectively to encourage that MWR. 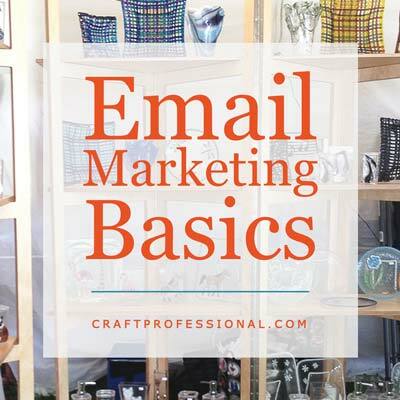 There is plenty of other jargon out there in the world of email marketing, but these terms cover the basics and are the ones you're most likely to come across and care about when you're getting your newsletter started. 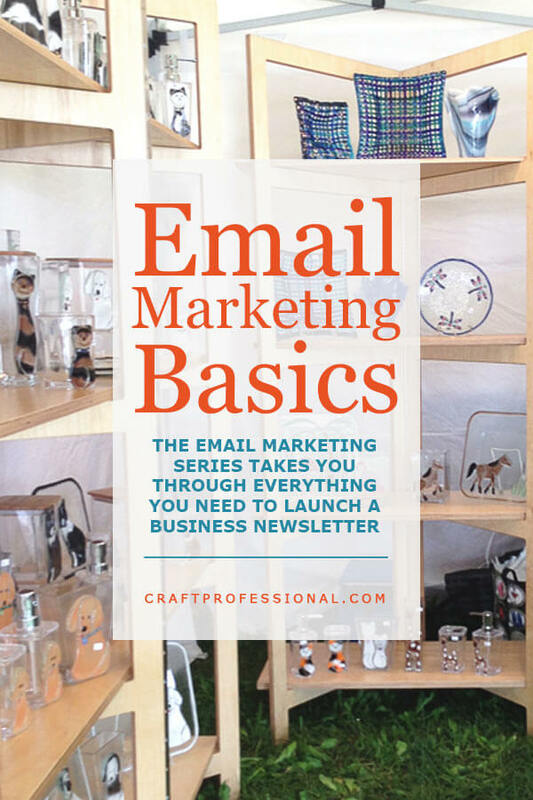 Now that you're armed with newsletter marketing lingo, you're ready to dive in to the series on email marketing basics. 1. What is email marketing, and why should you use it to grow your business? 2. 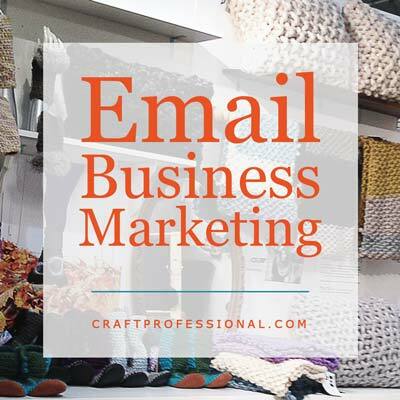 How can email marketing help you sell more crafts, and why should you build an email list if you already connect with customers on social media? 3. What should you write about? 4. How often should you publish your newsletter? 5. What companies can help me publish a professional, affordable newsletter? 6. How do I get people to sign up for my newsletter? 7. How do I keep subscribers interested so they continue to open my emails? 8. How do I make smart, strategic decisions about my newsletter? The Email Marketing Series: Start here for definitions, and links to all articles in the series. How email marketing can benefit your business. 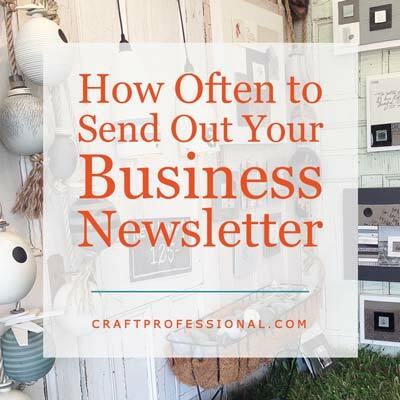 Sell more crafts with your newsletter, plus, why you need a newsletters vs. social media marketing. 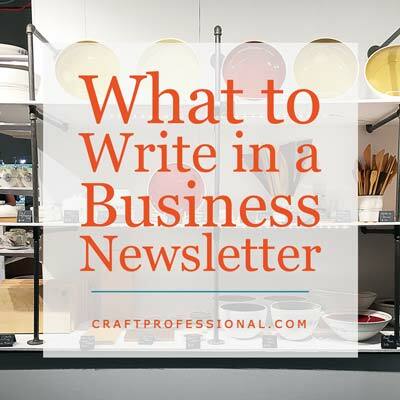 What to write about in your business newsletter. How often to send your newsletter. Find the right company to host your newsletter. 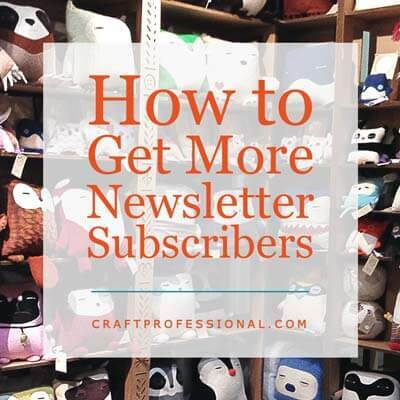 How to get more people to sign up for your newsletter. 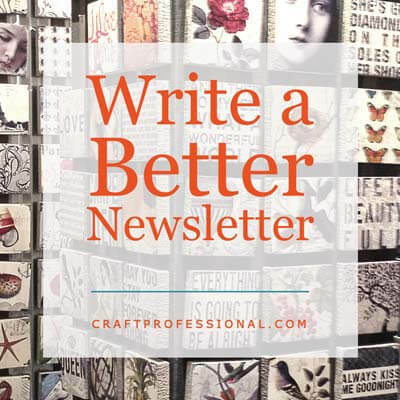 Write a better newsletter, and keep your subscribers engaged. The smart way to improve your newsletter.